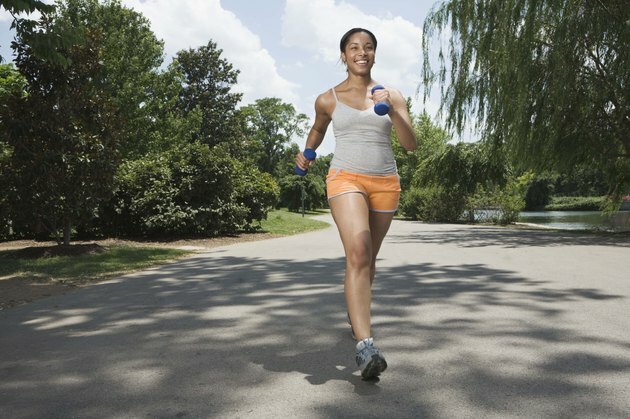 Most runners experience knee pain at some point, particularly if they run on hard surfaces like concrete and asphalt. Much of this pain has to do with the high-impact nature of running, which sends shockwaves up the lower body and compresses bone and cartilage against one another. Over a long period of time, and if you don't take care of your body well, running can wear down your ankle, knee and hip joints. The meniscus is a structure in the knee designed to help prevent this, but it isn't immune to injury of its own. The meniscus's primary function in the knee is to serve as a shock-absorbing buffer within the knee. It is a crescent-shaped disc of connective tissue placed between the tibia and femur and just below the patella. This keeps the two large bones that meet in the knee joint from grinding directly against one another, and it also improves stability in the joint. This pad is of utmost importance to runners, who rely on the meniscus to absorb shock from running and keep the joint from creating friction and pain. Most meniscus pain is related to a tear. This isn't necessarily a straight-across tear, though -- a meniscus tear can also comprise wearing at the edge of the tissue. You may still be able to use the joint when the initial tear occurs. Many competitive athletes continue to play with a torn meniscus when the initial damage occurs. But several days after the injury, you may experience swelling and immobility of the joint. Running is not a common cause of meniscus pain, but injuries or damage to the knee can sometimes cause tears. Knees can get twisted if a runner steps wrong or on loose or uneven footing, and it is possible for wear and tear in the knee joint to gradually wear at the meniscus -- particularly in older runners. If left untreated, part of the meniscus tissue can float out into the joint and cause slipping, popping and/or locking of the joint. A meniscus tear can be identified by pain, stiffness and swelling in the joint. You may experience locking of the knee joint, depending on how the meniscus has been damaged, or you may find it difficult to bear weight on the joint. In many cases, your range of motion with the knee will be reduced to varying degrees. Running is likely to be painful or difficult to perform at all, particularly if the injury is limiting the range of your stride. Treatment is determined by the severity of the condition. X-rays and/or magnetic imaging is usually used by doctors to evaluate the extent of the injury. If the tear occurs at the outer-third of the tissue, surgery may not be required. Tears on the interior of the meniscus, on the other hand, often require a surgical procedure and then rehabilitation before you can resume running.